As Members of the Calimesa Breakfast Lions Club, we are honored to take part and support many worthwhile charity's within our own and other community's. Lions are men and women who volunteer their time to humanitarian causes in their local communities, and around the world. By conducting service projects and raising funds, Lions are dedicated to helping those in need. 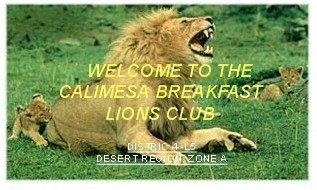 The Calimesa Breakfast Lions are members of the "International Association of Lions Clubs", and was founded in Chicago in 1917 by a insurance agent named Melvin Jones. Since 1917, Lions clubs have offered pepole the opportunity to give something back to their communities. From involving members in projects as local as cleaning up an area park or as far-reaching as bringing site to the world's blind, Lions clubs have always embraced those committed to building a brighter future for their community. Today with more than 46,000 clubs in 193 countries and geographical areas, Lions have expanded their focus to help meet the ever-increasing need of our global community.